Adhesive capsulitis is a painful, progressive loss of shoulder motion. The shoulder is usually stiff and will not move. This condition is called "frozen shoulder". When a patient presents with adhesive capsulitis, they are unable to move their arm up or turn it to either side either with or without assistance (passive/active range of motion). Typically adhesive capsulitis occurs in approximately 2% of the population and usually affects people 40-60 years of age. Frozen shoulder tends to occur more often in females. The loss of motion occurs due to inflammation, fibrosis, scarring and contraction of the capsule. Adhesive capsulitis has no proven connection to occupation or arm dominance. For a normal shoulder joint capsule, the capsule is elastic and allows for a great range of motion (Figure 1). 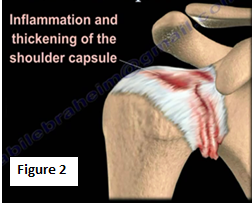 Inflammation and thickening of the shoulder capsule may lead to adhesive capsulitis (Figure 2). Frozen shoulder may occur without any specific cause; however, it may also be triggered by a mild trauma to the shoulder. Frozen shoulder pain is severe, especially with movement. Typically the pain is so great that the patient is unable to sleep. 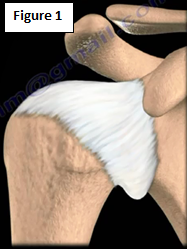 Eventually the patient will be unable to move the shoulder from the pain and the condition will lead to stiffness of the shoulder (Figure 3). The condition is self-limiting and may resolve itself. Adhesive capsulitis develops slowly and goes through three distinct phases. The entire three-phase process will take time and sometimes may last up to several years. Phase one is pain and freezing. The pain is worse at night and increases with any movement. This pain will also last for several months. Phase two is considered the stiff or frozen phase. In this phase the range of motion is limited as pain is diminishing. This phase may last up to one year. Phase three is the resolution phase. In this phase the pain diminishes with gradual return of motion. This phase may last several years. There are a number of conditions associated with frozen shoulder, which include diabetes, thyroid problems, autoimmune disease, stroke, and rheumatoid arthritis. Frozen shoulder can also develop from trauma or can occur post-surgery. But the most common conditions associated with frozen shoulder are diabetes and hypothyroidism. Frozen shoulder occurs more often in people who are diabetics. The occurrence of adhesive capsulitis in diabetics is approximately 10%-20% . The reasoning behind the occurrence of frozen shoulder in diabetic patients is unknown. Diabetics usually have a worse outcome regardless of treatment and are at risk if they have increased age, increased duration of diabetes, and have diabetic neuropathy. The condition can be bilateral (affect both shoulders). External rotation of the shoulder is very limited in patients with frozen shoulder. X-rays are needed to rule out degenerative arthritis and posterior dislocation of the shoulder. An MRI or arthrogram will show small amounts of fluid in the joint cavity or a contracture of the joint capsule. The rotator cuff may appear normal. Treatment for adhesive capsulitis includes: anti-inflammatory medication, physical therapy, gentle stretching program (as symptoms allow), injections, manipulation under anesthesia, and surgery. Surgery will include the release of the capsule when nonoperative methods fail. Manipulation and surgery are the last resorts. Over 90% of patients improve with simple treatment and physical therapy. The earlier the condition is diagnosed and treated, the better the result of the treatment. Make sure to always check for diabetes in patients with adhesive capsulitis!